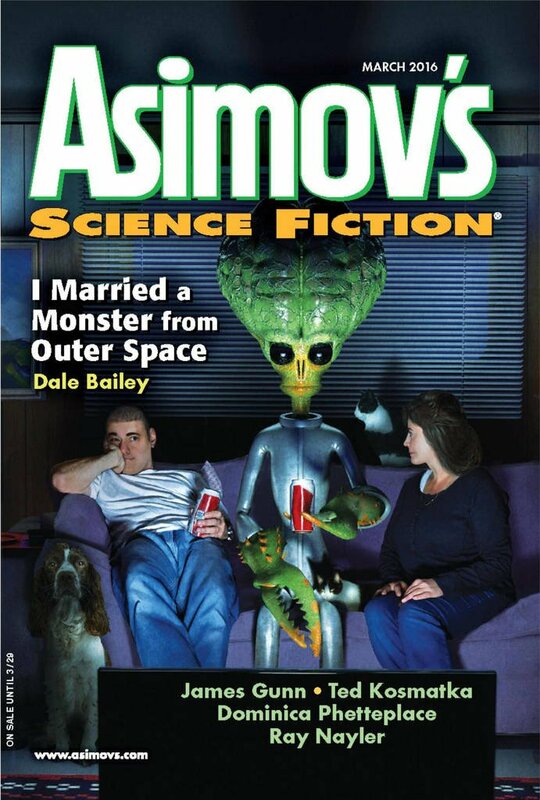 "I Married a Monster from Outer Space," by Dale Bailey [bio] (edited by Sheila Williams), appeared in Asimov's Science Fiction issue 03|16, published on February 18, 2016 by Penny Publications. This is the story of how an ugly space alien fixed Ruth and Donnie's relationship. We learn enough to love Ruth, despite her faults, and we even see why Ruth loved Donnie, although he's not very loveable until the end of the story. And, of course, the "monster from outer space" that Ruth married was Donnie, not Gort. But the real star of the story is Gort, even though he hasn't got a single line of dialogue. Instead he's in one hysterical scene after another. Probably the best being when he drove them home from Hooters because Ruth and Donnie were both drunk. Donnie's mechanical aptitude is likewise hilarious; the scene where he tells Gort he had trouble finding parts for his flying saucer was probably the best. Reading this story means laughing enough to draw funny looks from people. But besides the humor, there's a serious side; Ruth and Donnie are both failures at life, even though they have strengths. They ought to complement each other's weaknesses, but they're just drifting. They really are "space monsters" to each other. We see what they could be, and, somehow, there at the end, Gort repays them for their kindness to him. We realize why Gort kept looking in that room, opening that closed door. "Gort had torn it open for both of us." When they walk away from his saucer, their grief is healed, and they go on to become what they should have been in the first place. Bravo!